I tried my best to stay sensible during the past Black Friday/Cyber Monday storm, and I survived after making (only) a few makeup purchases (for now anyway, since these crazy companies extended their sales and I am sure they will run new ones in the name of holidays). However, I effectively ruined my lippie ban and even managed to make an impulsive color choice at that. 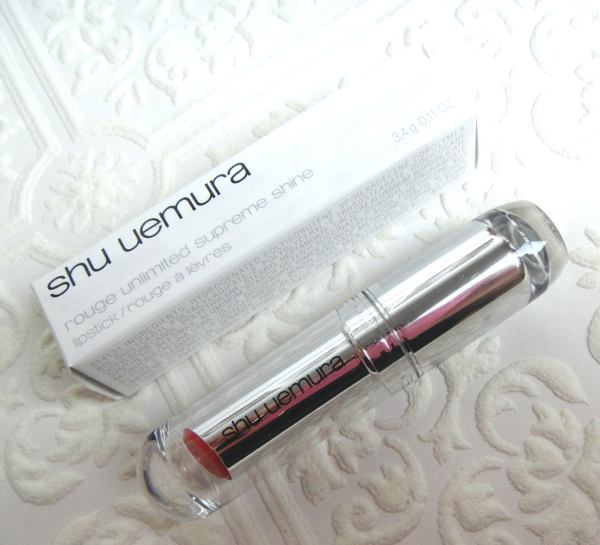 I have always admired Shu Uemura makeup. I have only experienced the famous eyelash curler and their pressed powder formula, but the color payoffs seem to be superior to many others. Not that they are buttery soft and packed with intense pigments, but they always show up with beautiful clarity that reminds me of watercolor paintings. I wanted to see how their lipsticks reflect that qualities, and the Rouge Unlimited sounded like right up my alley for being light weight lipstick range that boasts the technology of "pure color delivery". I have a habit of choosing a safe color when it comes to a high-end purchase, but this time I felt a little wild for some reason, so I picked something out of ordinary - a warm toned red with shimmer. The packaging of Rouge Ultimate consists of both clear plastic and silvery metal. It is nothing fancy compared to the ones with similar price range (Yves Saint Laurent, for example), but this will do if you like simple minimalistic designs with sophistication. 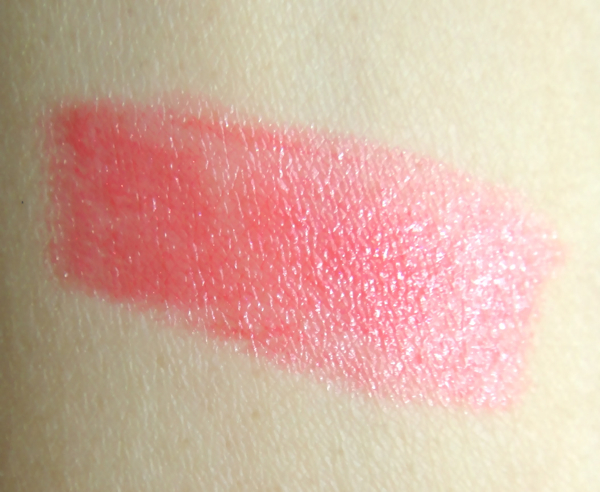 Baby Flame is a bright coral red that flashes subtle pink shimmer. It was introduced as a part of "Sweet Red" collection of this year. This color is with just one swipe. 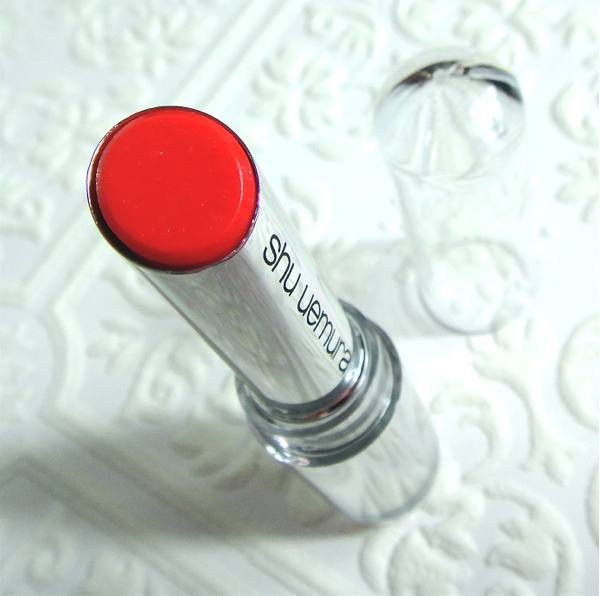 On my lips, it is a vivid and juicy red with both pink and coral tones. More importantly, I was floored by how amazing it feels on my lips. The formula is very moisturizing and almost wet, but it goes on very light hugging my lips. I didn't have to swipe back and forth to achieve the color as I would do with some of the sheer lipsticks. It stays on about a couple hours with normal eating and drinking, but it leaves a faint pink stain behind which I find quite attractive. 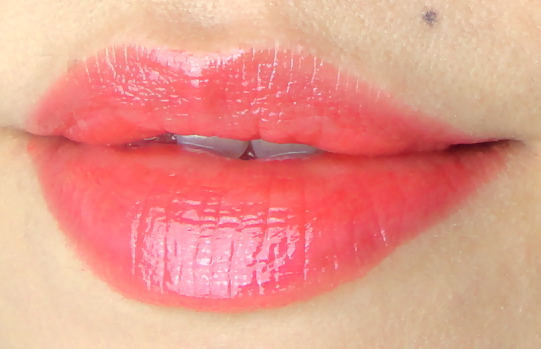 I pulled out all the coral pink/red lippies I own (I don't have many, btw) to see how they compare to each other. It is funny to see the big color difference between Blushing Sequin and Baby Flame in swatch since they show up somewhat similar on my lips. Baby Flame has more color intensity and shine although they both go on sheer and moisturizing. 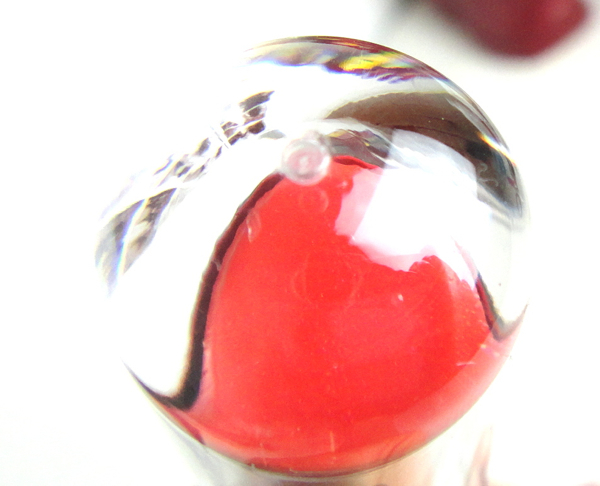 Colorwise, Red Lacquer is the closest to Baby Flame, but the Revlon color has a waxy formula with less pigmentation. I totally forgot about Strawberry Fraise until I attempted this comparison (Shame on me, and I'm sorry, Strawberry Fraise cause you're pretty, too.). Surprisingly it is the reddest and most opaque one despite of its lipgloss identity. 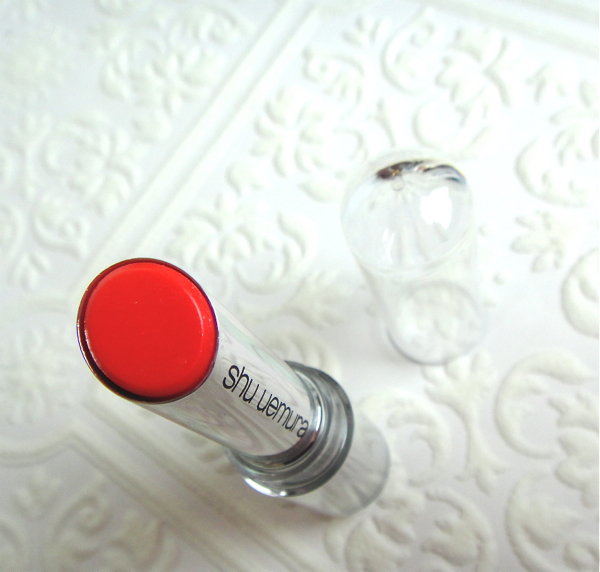 Shu Uemura Baby Flame is an excellent lipstick with light moisturizing formula and vivid color, plus it is another warm-toned red that seems to work on my complexion. It is a real shame that Shu Uemura has officially bowed out of the U.S. (meaning they are not avail at brick and mortar stores, but then I always hated visiting Bloomingdales for Shu anyway) but they are still available online. I purchased mine HERE. Nowadays, I try not to write off any color because I am slowly learning that the formulation matters more than the color itself.